The 2019 Yamaha AR190 has been given a complete redesign. The 19' platform is now 19'5" LOA and is 8'2" wide. Featuring all new V Buckets which allow for amazing reverse steering. The Captain's Chair is redesigned to be more ergonomic. All New Hinged Seating and Conext System Dash with Clarion Stereo at the Helm. The glove box has been integrated into the portside seating. A Dinette Table has been added and mounts behind the Captain's Seat. 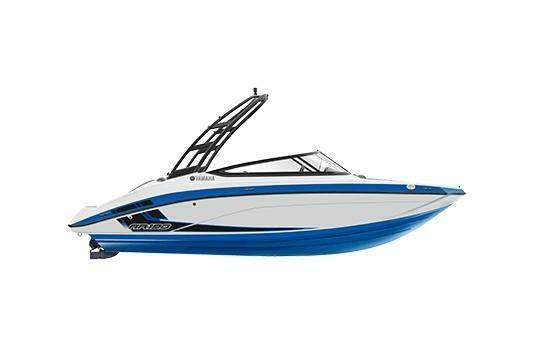 The Yamaha 190's are the number one selling runabout in the 19-foot category is packed with family-friendly amenities not found on competing boats. Other key features include: Forward Folding Waketower w/Bimini Top, Articulated Keel System, a roomy interior layout with extra storage, an award-winning, two-tiered swim platform and a reliable, 1.8 liter Yamaha Marine engine. Comes standard with a trailer at no extra charge, making it the best value on the water. Sale Price Does NOT Include Freight and Dealer Prep.